Update: Omega 8007 has a new name. It’s now the Omega 8006HDS. You can refer to the Omega 8006 review for more details. The Omega 8007 Juicer & Nutrition Center comes with several upgrades from the 8004/8006. These new features make this masticating juicer more efficient than the previous models. It comes with a 2 HP motor, BPA free parts, 25% larger funnels, larger and stronger screen housing with dual stainless steel inserts. All these features take the 5th Generation Nutrition Center to a whole new level of juicing efficiency and durability. Another upgrade to this model is that it only weighs 13 pounds! With that said, the handle is more of a “hood” style, in that you simply slip your hand under the “hood” of it and lift from the top of the machine. The Omega 8007 retain the best features from its predecessors. It also comes with a dual stage 80 RPM motor ensuring maximum nutrient retention. Also, the gear is still made of tough Ultem plastic. Plus, it still has the qualities of a nutrition center. It can puree, mince, chop and grind. If you’re wondering what’s the difference between this machine and the Omega 8008 Juicer, you’re not the only one. It’s exactly the same machine as its sibling. All their features are identical but their color. Omega J8007S comes in Silver, while J8008C has a chrome finish which made it a little more expensive. The ending letter on their product codes is a dead give away. This cold press juice extractor can be set up in less than a minute. Even though this version comes with a larger food tray, you still need to cut up the pieces because the chute is no larger than the previous versions. The food tray is a convenient spot to place the produce as you feed it into the machine, especially since it allows for more produce. Slice your produce into smaller sections so they fit smoothly down the tube. Use the plunger to help feed the produce into the barrel. You will need to keep a small amount of pressure on some of the items to ensure they properly catch on the auger. Since this is a dual-stage masticator, it crushes the produce and then presses it against the stainless steel mesh juicing screen. If you really want to extract the most juice from your produce, drop the pulp back through your juicer. Strain to remove additional pulp after the juicing is complete. If you juice a significant amount of citrus, the sieve may become clogged with pulp forcing you to clean it out in the middle of juicing. Waiting to use the sieve will cut down on juicing time. Once you have completed juicing, cleaning this piece of machine is a breeze. Pull the machine apart; place them under warm, soapy water, and wash. Rinse and lay everything out on a small towel to dry. It takes less than five minutes to wash and rinse the parts. Make sure to utilize the stiff cleaning brush to remove the pulp from the juicing screen and the sieve. It is really fantastic at removing stuck citrus pulp. The parts of this juicing machine may be placed on the top rack of your dishwasher, but rinse them after juicing to prevent the hardening of any leftover pulp. The Omega 8007 Nutrition System efficiently extracts the most juice and nutrients from your vegetables and fruit through Omega’s exclusive “dual stage” mastication process. The items pass through the drum, are crushed by the auger, and finally squeezed against the stainless steel juicing screen. This final stage removes the remaining juice and the pulp is automatically pushed out of the opening, passing through the opening at the end cap. Because this method of extraction is completed slowly, you end up with high-quality juice that is full of flavor. It also contains the most enzymes and vitamins when compared to other brands of juicers on the market. Store your juice in a preferable glass container with a very tight lid. It should keep for up to 72 hours. Not only it can help you prepare healthy juices, but it also serves additional functions to provide variety in your juicing routine—food processor, homogenizer, pasta maker, coffee grinder. What Kinds of Produce Can Omega 8007 Juice? This juice press can process soft and hard produce, leafy greens, citrus fruits, beans, and nuts. Hard produce include cilantro, pear, sweet potato, watermelon, pepper, garlic, bitter gourd, apple, pineapple, turmeric, ginger, yakon, broccoli, pumpkin, cucumber, beets, celery, coconut, cauliflower, carrots, fennel, and asparagus. Leafy greens include moringa, peppermint, kale, spinach, dandelion greens, spring onion, brussels sprout, cabbage, pine tree needles, romaine lettuce, lettuce, collard greens, wheatgrass, basil, parsley, and beet greens. Citrus fruits include lemon, grapefruit, mandarin, lime, tangerine, and orange. Soft fruits such as cranberries, strawberry, papaya, avocado, tomato, blackberry, grapes, melon, mango, kiwifruit, peach, and pomegranate can be turned into a puree using the blank screen. You can use this machine for making soy and almond milk as well. The Omega 8007 Nutrition Center comes with a powerful commercial grade motor that effortlessly and quietly juices your vegetables, fruits, leafy greens, and much more. Outside of the hum of the motor and the crushing or crunching of your produce, this machine operates quietly. In addition to juicing more efficiently than single stage masticating juicers, the juicing screen has 25% more screen, covering more surface area and yielding more juice in a single pass. Not only is this machine a highly competent electric juicer, but also makes pasta, soy milk, nut butter, baby food, sorbets and much more—it is versatile without compromising in quality. 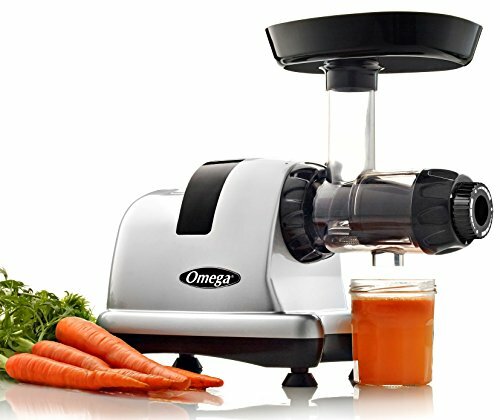 The Omega juicers come with the longest warranty among other juicer brands on the market—that makes them an investment. When you think about it, the Omega 8007 Juicer is an investment in your health. After all, isn’t your health worth it?